"FORESTIST" (formerly Journal of the Faculty of Forestry Istanbul University – (JFFIU) / İstanbul Üniversitesi Orman Fakültesi Dergisi" has been regularly published since 1951 by Istanbul University - Cerrahpaşa Faculty of Forestry. This journal has been peer-reviewed since 1998 and international peer-reviewed since 2010. Our journal provides knowledge of forestry science and related disciplines in the field of the developments and research in the international field of researchers, educators and practitioners. JFFIU is the most established of forestry journals in Turkey spanning 69 years of its history. Our former English journal title was “Review of the Faculty of Forestry University of Istanbul”. Our journal published Series A and Series B between 1951 and 2009. We integrated Series A and B in 2010 and the new edition began to be published titled as the "Journal of the Faculty of Forestry Istanbul University”. In this context, JFFIU applied to the ISSN Turkey office to get new ISSN numbers on February 5, 2010 and February 18, 2010. The ISSN Turkey office gave JFFIU the numbers ISSN 0535-8418 and e-ISSN 1309-6257. The title of "Journal of the Faculty of Forestry Istanbul University" was change to "FORESTIST" from January 01, 2018. FORESTIST has been mostly changed after the restructuring, new editorial board and new journal staff since 2014. 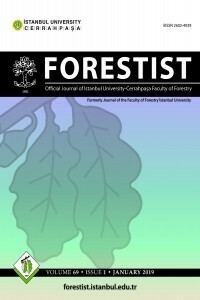 "FORESTIST" is the official journal of the Faculty of Forestry at Istanbul University - Cerrahpaşa. It provides both a national and international research forum for the exchange of knowledge dealing with various issues of forestry, wood science and technology as well as landscape architecture. Since 2014, published articles have begun to be assigned DOI numbers and CrossRef in FORESTIST. From 2016, the articles will begin to use the QR Code (Quick Responce Code) in FORESTIST. In consequence of the evalution that was conducted by ISI Thomson Reuters (Clarivate Analytics), our journal has been accepted for inclusion in ESCI (Emerging Sources Citation Index) which is the first step of indexing in SCI-Exp (Science Ciation Index Expanded) dating from 19 September 2017. "FORESTIST (formerly Journal of the Faculty of Forestry Istanbul University)" is now indexed in Web of Science- ESCI Emerging Sources Citation Index from its January 2016, 66(1) issue. "FORESTIST (formerly Journal of the Faculty of Forestry Istanbul University – (JFFIU) / İstanbul Üniversitesi Orman Fakültesi Dergisi" publishes two issues annually (January and July). FORESTIST is an international, scientific, open access periodical published in accordance with independent, unbiased, and double-blinded peer-review principles. The journal is the official publication of İstanbul University-Cerrahpaşa Faculty of Forestry and continues publication since 1951. Forestist is published biannually on January and July and the publication language of the journal is English. FORESTIST aims to contribute to the literature by publishing manuscripts at the highest scientific level on all fields of forestry. The journal publishes original articles, reviews, and brief notes that are prepared in accordance with the ethical guidelines. The scope of the journal includes but not limited to; forest, forestry, forestry based industries, landscape and environment. The target audience of the journal includes specialists and professionals working and interested in all disciplines of forestry. FORESTIST is currently indexed in Web of Science-Emerging Sources Citation Index, DOAJ, CABI, TUBITAK ULAKBIM TR Index, and Gale. All expenses of the journal are covered by the İstanbul University-Cerrahpaşa Faculty of Forestry. Processing and publication are free of charge with the journal. No fees are requested from the authors at any point throughout the evaluation and publication process. All manuscripts must be submitted via the online submission system, which is available at http://dergipark.gov.tr/forestist The journal guidelines, technical information, and the required forms are available on the journal’s web page. Statements or opinions expressed in the manuscripts published in the journal reflect the views of the author(s) and not the opinions of the İstanbul University-Cerrahpaşa Faculty of Forestry, editors, editorial board, and/or publisher; the editors, editorial board, and publisher disclaim any responsibility or liability for such materials. All published content is available online, free of charge at http://dergipark.gov.tr/forestist and printed copies of the journal are distributed, free of charge. İstanbul University-Cerrahpaşa Faculty of Forestry holds the international copyright of all the content published in the journal.